Stem: trunk < 20 m, < 2.9 m wide; mature bark dark brown, deep-furrowed, in rectangular plates; mature crown branches reaching ground or not. Leaf: 5 per bundle, 2--9 cm, stiff, generally curved; bundles in dense tufts at branch ends; sheath deciduous. Seed Cone: spreading, 7--15 cm, oblong, yellow-brown, opening late 2nd year; stalk < 2 cm; scales thinnest at tips, angled, prickle 0. Seed: wing generally persistent on scale. Ecology: Lodgepole, subalpine, bristlecone forests; Elevation: 1830--3700 m. Bioregional Distribution: SNH, TR, PR, SNE, n DMtns; Distribution Outside California: to western Canada, South Dakota, New Mexico. 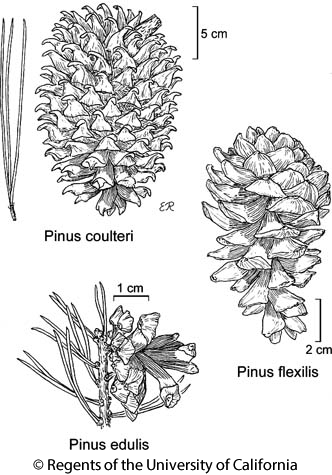 Citation for this treatment: J. Robert Haller & Nancy J. Vivrette 2012, Pinus flexilis, in Jepson Flora Project (eds.) Jepson eFlora, http://ucjeps.berkeley.edu/eflora/eflora_display.php?tid=38277, accessed on April 21, 2019. SNH, TR, PR, SNE, n DMtns; Markers link to CCH specimen records. Yellow markers indicate records that may provide evidence for eFlora range revision or may have georeferencing or identification issues. Purple markers indicate specimens collected from a garden, greenhouse, or other non-wild location.